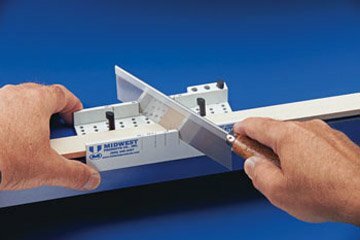 This Deluxe Easy Miter Box from Midwest Tools is an improvement over other typical miter boxes that it allows you to cut four miter angles. It can cut 30, 45, 60 and 67.5 Degree plus the 90 Degree cut. It accepts materials as wide as two-inch and as thick as 1/2-inch. Injection molded construction, it also features three unique CAM Clamps which hold the material being cut firmly in place. The Deluxe Easy Miter Box includes a handy razor saw, the perfect size for our miter boxes.